The Southern Illinois University Edwardsville East St. Louis After School Performing Arts Program hosted its Spring Recital Thursday, May 18 in Dunham Hall on campus. 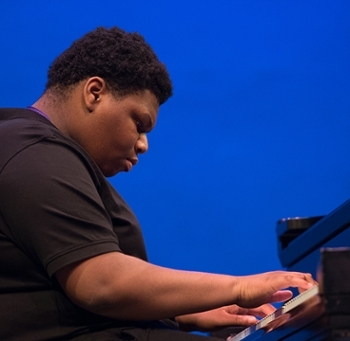 The recital showcased the musical talents of approximately 25 students ages six to 17. Performances included contemporary dance, piano, hip hop dance, studio guitar, band and West African drumming and dance. The After School Performing Arts Program in East St. Louis was founded by Katherine Dunham and has been an integral part of the community for decades. After a five-year hiatus, it has returned to the delight of community members. The program also operates a six-week, full day fine arts summer camp for 80 youth ages six to 17. Participants experience dance and music classes, enjoy field trips and will be part of a large production on Friday, July 14. Enrollment is open for the camp, which runs Monday-Friday, June 5-July 14. For more information or to register, visit siue.edu/summer/camps. Photo: (L-R) Jada Washington-Holt, Jackie Parker, Jade Washington-Holt, Gysai Sylla and instructor Tyler Elder perform Aura Lee during the East St. Louis After School Performing Arts Program Spring Recital. 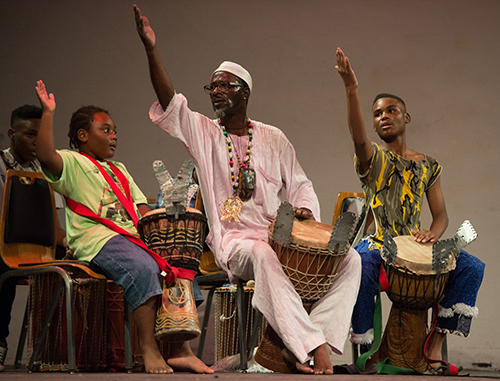 Demetrious Sylla (left) and Gysai Sylla (right) participate in a West African drum performance with their father Gerald Williams, ESLC Performing Arts Program alumnus and drum instructor (center). Aaron Strauther played Fur Elise as a piano solo during the recital.